No Kornstad Solo concert is alike. Since a much-revered debut at Bergen's "Ståoppjazz" in 2003, he has been experimenting with solo shows, from 15 minutes up to full 70 minutes sets. At first he went unplugged, trying to discover all the exciting sounds that the saxophone could make. He also "invented" his own instrument – the flutonette, pairing the flute with a clarinet mouthpiece, evoking sounds of the far east. Then around 2005, he started to implement electronics - just one single loop machine (The legendary Electrix Repeater) creating soundscapes and beats to play on top of. ​The first solo album "Single Engine" came in 2007, to critical acclaim. The album featured the track "Sweden" where Kornstad blends multiphonics with melodic playing, being one of the first to use these alternative techniques for saxophone in such a way to accompany his melodies. 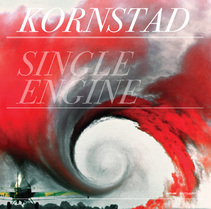 Single Engine also featured guest appearances by guitarist Knut Reiersrud, keyboard player Bugge Wesseltoft and bass player Ingebrigt Håker Flaten. After having played extensively solo for a couple of years, Kornstad decided to make a solo album out of ideas he had gathered "on the road". He spent two nights in the beautiful acoustics of Sofienberg Church in Oslo, just playing. Picking out the best of over six hours of music, this formed the album Dwell Time. Two years later he made Symphonies in My Head, following the same recipe. The sequel to Dwell Time, with saxophone, flutonet, looping.